It’s Monday morning and as usual I am stuck in bumper to bumper traffic on Glendale Blvd. As I am cut off by a truck on my left and someone merging into my lane on my right, I sigh, gaze out my car window toward the heavens and was greeted by this. It pretty much sums up my commute, and I planned to post this picture with that single commentary. After I snapped this pic I wanted to know more about this ambitious project. Was this some guerilla artist? Did the building owner commission the work? My research did not turn up much. Tonight I started to forward my photo to one of my favorite sites, Wooster Collective. It turns out that the W.C. already had the answers to my questions. 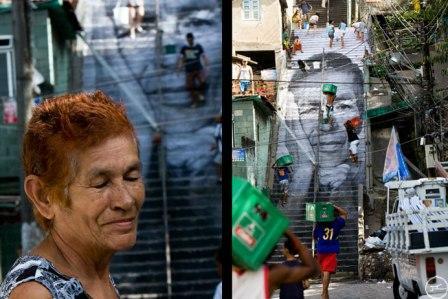 The artist’s name is JR, and the story behind his work is far more complex than his simple initials. 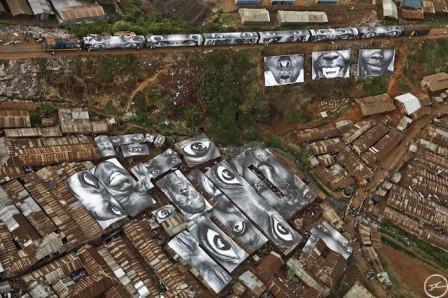 JR has made a name for himself in the street art community for taking 28 millimeter photos of local residents, superimposing them and pasting the blown up works on buildings in the neighborhoods where his subjects live. 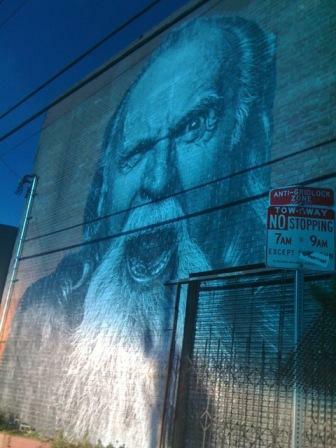 Since mid-February JR has been in Los Angeles posting a series of murals called “Wrinkles of the City”. My grumpy old man/metaphor for traffic is his most recent work. The Parisian artist received worldwide notoriety during the Paris riots of 2005 where photos of burning cars we taken with one of JR’s murals in the background. JR has since traveled the world using his unique hybrid of photography and graffiti art using buildings, roof tops, train tops, etc. to tell his story. His work is self-funded. His goal is to bring art into communities where people do not have access to museums. One of his more poignant installations was during his trips to Sierra Leone and Brazil where JR worked on a project called “Women Are Heroes”. The large scale photographic murals gives strength and a unique voice to a population of women who have endured unimaginable hardship. JR was nominated for a TED award for 2011. TED is a non-profit organization that awards $100,000 cash prizes to individuals to fulfill “one wish to change the world”. The organization is funded by members from Silicon Valley, the Entertainment and Design Industries, and JR will announce his plans for the award on March 2, 2011 at the TED Conference in Long Beach. For more information on JR’s TED announcement, please click here.